NEW YORK -- A woman faces murder charges in connection with the death of a man found under a mattress in a New York City hotel, and police are searching for five other suspects. Christine O'Brien, 31, faces one count each of robbery and murder in connection with the death of Roderick Goodwin, 28. 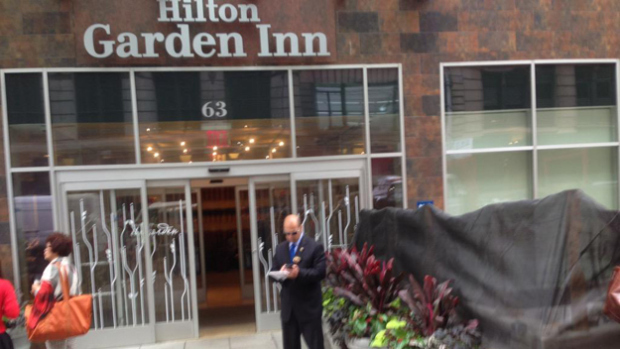 Goodwin was found inside a Hilton Garden Inn hotel in midtown Manhattan around 4 a.m. Monday morning. He suffered multiple injuries, including sharp-point trauma to the head and body, according to a criminal complaint filed by police. Goodwin was from Bridgeton, N.J., and may have been a pimp, according to The New York Times, which reported that police believe one of the women involved in the case may have been a prostitute. Detectives in the case say O'Brien admitted she was with Goodwin in his hotel room, before going to the lobby to let four males and a female into the hotel, and up to the room. She allegedly told detectives that she and the other suspects struck Goodwin in the head with a bottle and then repeatedly punched and kicked him, while demanding the code to his room's safe. Hotel management told police that other hotel guests reported hearing screaming. Unable to open the safe, they allegedly carried it out of the hotel, concealed in a sheet. Police say they have surveillance video from the hotel of the suspects entering and then leaving with what looks like a safe, tucked beneath a sheet. Police have not indicated whether they know the identities of the other suspects.